UC Davis College of Biological Sciences faculty, researchers and students produce substantial and innovative research, driving discovery to meet the most pressing challenges of our world. 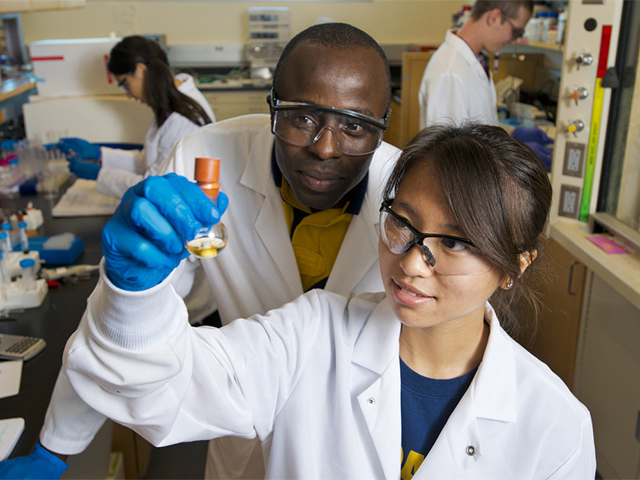 Conducting science takes a concerted effort from many individuals, and scholars at UC Davis benefit from the opportunity to approach research in an interdisciplinary manner. With access to state-of-the-art core facilities and campuswide centers like the Coastal and Marine Sciences Institute, the Center for Neuroscience, the Center for Population Biology and the Genome Center, UC Davis is leading the future of life sciences research. We're also home to many Research Core Facilities that provide state-of-the-art technology, equipment and research spaces to support institutional research. Our college is organized into five departments that span the gamut of life sciences. We are the administrative home of four campuswide, interdisciplinary research centers. Our college houses world-class infrastructure as part of the Core Facilities Program.